Hey guys! Today I wanted to do a quick review of the Eufy Robovac because I am literally obsessed with it. 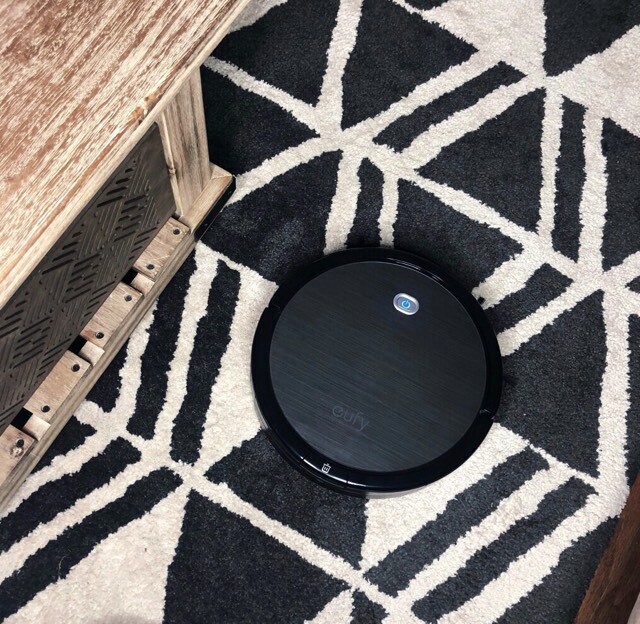 I have been wanting a robot vacuum for a while now so when Anker approached me about trying one of their Robovacs, I was stoked. My first impression after unboxing the vacuum was that it is very well made. After reading some instructions and picking up a few things off the floor, I let this thing go around my house. The sound is noticeable but also much quieter than my other vacuum. You can also use the remote that comes with it to set it to vacuum every day at a specific time so you don't have to even be home. I did mine the first few times at night so I could be there and Lucy could get used to it. I recommend this if you have pets because she was definitely skeptical at first. As far as performance goes, I am shook. This thing was pulling pine needles from my base board from Christmas! I vacuum quite often so this blew my mind. The next thing is my area rug. My Dyson struggles with this rug because of the thickness but this vacuum goes from hardwood floors to the rug with ease. It did get a little hung up on my bathroom rugs but that was expected. When I went to clean this thing out I was shocked how much debris it picked up. This thing found glitter and I don't even know the last time I used glitter. I'm telling you guys for the 250$ price point, this thing is worth every penny and then some.